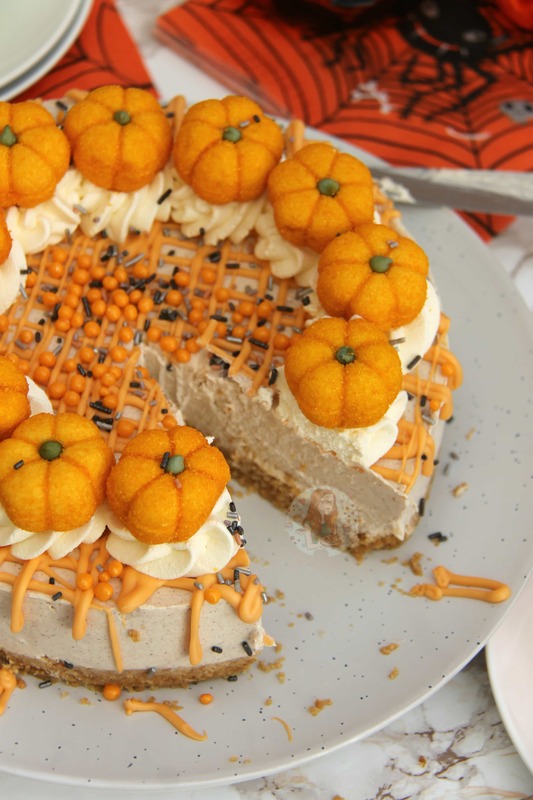 Perfect Treat for Halloween and Autumn, A No-Bake Pumpkin Spice Cheesecake. 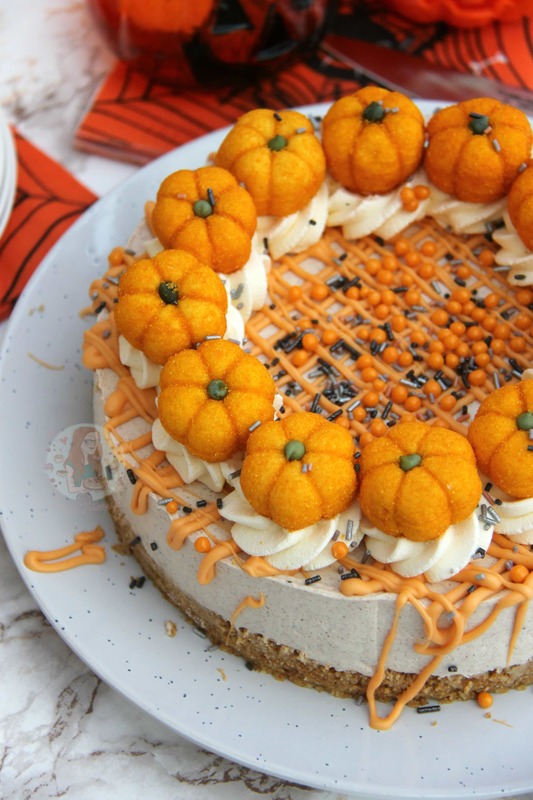 DIY Pumpkin Spice, and an Easy Vanilla Cheesecake are Perfect Together! I knew that this year I HAD to do something Pumpkin Spice related, just to be in keeping with my obsession of Starbucks. 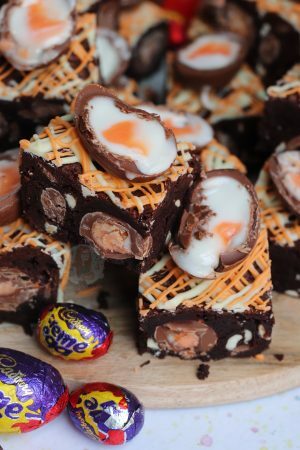 I’m not saying that Starbucks is like the reason for this recipe, but it definitely had an influence in me making it after a visit to my favourite local one and having a chat with the Baristas about my recipes! Aaaanyway, I used the Betty Crocker mix for the Pumpkin Spice as I wasn’t entirely sure where to start, and after a few trials of other mixes, this one definitely tasted the best. I went for a basic idea, and merged a simple No-Bake Vanilla Cheesecake (from my No-Bake Mini Egg Cheesecake recipe) with the DIY Pumpkin Spice. I wasn’t entirely sure how much of the spice to add, so I went with a level tablespoon. This is something you can play by ear, and add 1tsp at a time till you’re happy! Honestly, I thought I had put it waaaay too much the first time I made it, but with the icing sugar, and vanilla in the cheesecake the flavouring is just about right. You need the sweetness to counteract the strength of the spices, but its all personal taste really. 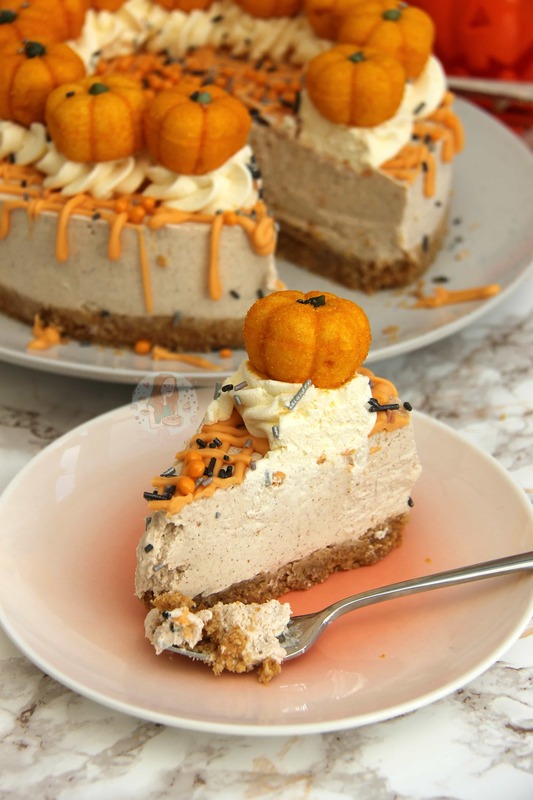 With the Pumpkin Spice, you can just make less if you wish, as this makes too much for just the cheesecake, but I make this amount and then bake other delicious Pumpkin Spice goodies with it! 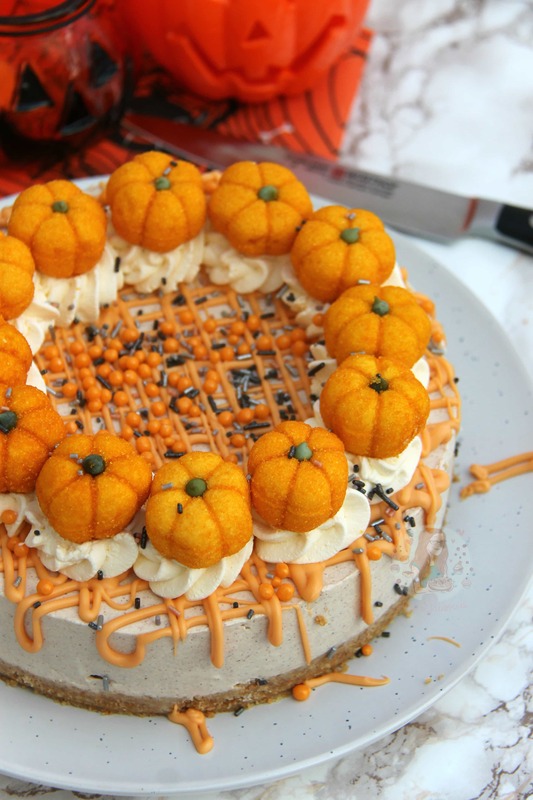 I will admit that I don’t really like Pumpkin related stuff… like the smell of the raw pumpkin after you’ve been carving it for Halloween does make me feel a little sick. 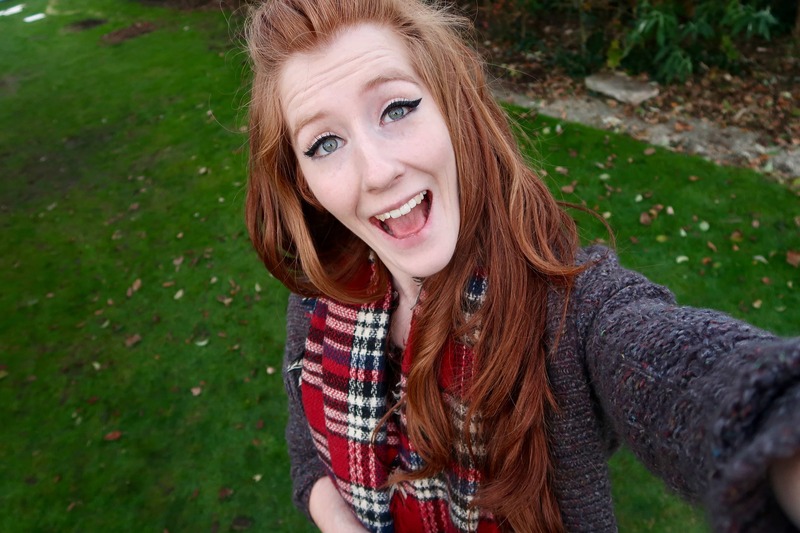 HOWEVER, I used pumpkin in my Pumpkin Cupcakes (kinda like a carrot cake) and it worked! It was the same with my Pumpkin Pie, I thought I would hate it, but I loved it because using the Puree, and adding the other ingredients made it delicious. I will say that I was also nervous about the Pumpkin Spice kinda thang because I am not the biggest PSL fan (purely because I shouldn’t have caffeine) BUT making the mix out of Cinnamon, Ginger, Nutmeg, All Spice and Ground Cloves made it delicious. Obviously, it might be different to the actual Pumpkin Spice flavourings you can get now, but I do think this made it delicious. 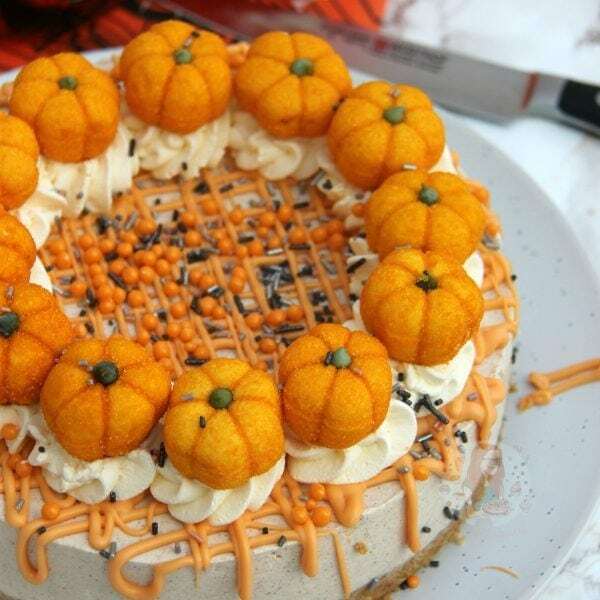 Who can not like a Halloween themed Cheesecake?! Enjoy! Add the Cinnamon, Ginger, Nutmeg, All Spice and Cloves to a bowl and whisk till even and incorporated – leave to the side. Blitz the biscuits in a food processor to a fine crumb, add the melted butter and pulse a few times until it is combined well. Whilst whisking slowly, pour in the liquid double cream and continue to whip on a medium-high speed until it is starting to thicken. Once it’s starting to thicken, continue to whip till very thick. Be careful though, as soon as its starting to thicken, keep an eye on it and taste frequently! Dollop onto the biscuit base and spread evenly. Leave to set in the fridge, covered, for 5-6 hours, or preferably over night. Once set, remove the cheesecake from the tin. Melt the White Chocolate and mix in some Orange Food colouring, drizzle it over the cheesecake. 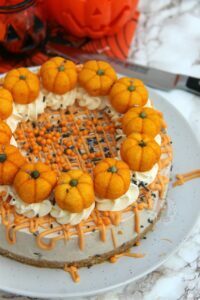 Whip up some double cream with the Icing Sugar and pipe little pirouettes of cream around the edge of the cheesecake, and add on the marshmallow pumpkins. 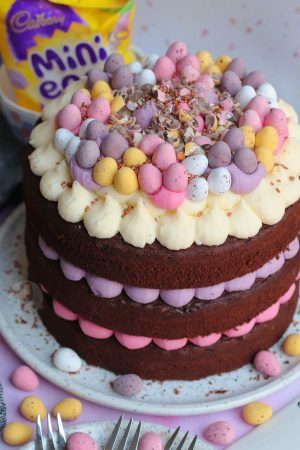 Sprinkle over some spooky sprinkles and you’re done! Enjoy! The DIY Pumpkin Spice recipe is from Betty Crocker! As I say, you can easily use less DIY Pumpkin Spice if you wish, but I wouldn’t really say any more than one tablespoon (personally) as I just think it would be too strong a flavour! 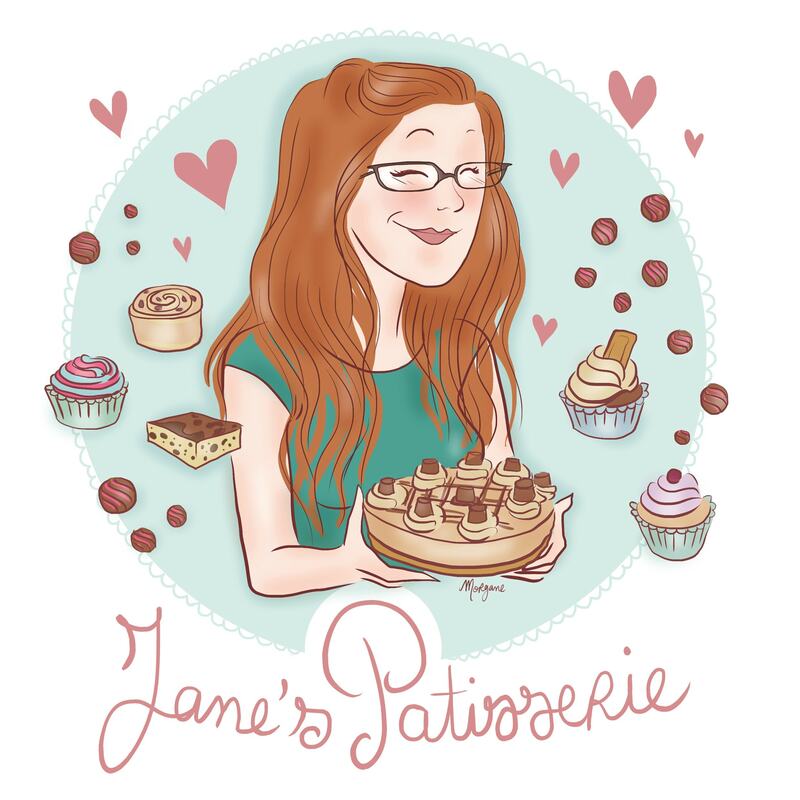 I always set my cheesecakes in the fridge overnight as its a more guaranteed set in the fridge, but you must also use full-fat ingredients otherwise it won’t work! You can use gelatine to help it set if you wish, but I personally don’t use it as I don’t believe it needs it. This cheesecake will last for 3 days, covered, in the fridge. 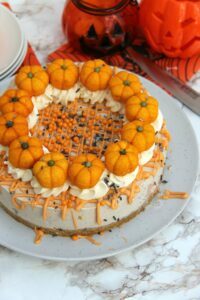 Find my other Cheesecake & Halloween Recipes on my Recipes Page! Older Next post: Apple Crumble Cake! Newer Previous post: Halloween Drip Cake! OMG! This cheese cake looks far too good to eat! Sounds extremely easy to make. I’m going to add it to my Pumpkin Spice list of things to make. Thanks for sharing. Where’d you get the cute marshmallow pumpkins? Mine were £1 from Asda. I wanted to make your Halloween chocolate cheesecake (I know it’s the wrong time of year, but I really liked it when I last made it). However there doesn’t seem to be a link to it anymore. 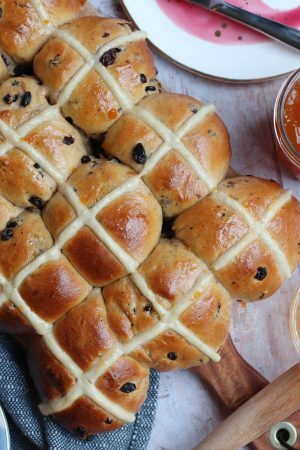 Any chance of putting the recipe back up? Awh thank you so much! I shall do!